Bishop Eddie Long, his face glistening with sweat, paces onstage before his cheering congregation. The video of that sermon, delivered during the early days of Long’s ministry in the 1990s, has gone viral. And now it is being discussed in the context of four lawsuits that claim the 57-year-old Long used his spiritual authority to coerce four young men into sexual relationships with him. Seriously, I can’t do this. “The job of the preacher is to bring fresh sperm.” It’s quite simple, really. Covered in every credible divinity school and seminary. Maybe you thought it was just a Catholic thing. You were wrong. 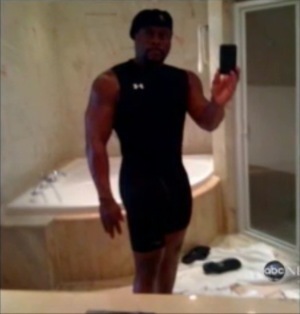 Please, look in the mirror at your body, like Eddie Long was doing in the picture at right. Also, if you’re a dude, you probably should send Bishop Eddie a picture, just so he knows you’re following his orders. Long’s explanation for why some men are gay, though, may appear puzzling. Because dudes are just too damn pretty, aren’t they, Eddie? I’m trying to report only fun/funny/happy news today, because it’s Friday. I think this counts.